(UPDATE - 1/12) For the second straight season, the Seattle Seahawks have made it to the NFC Championship Game. Seattle will play the Green Bay Packers, who defeated the Dallas Cowboys on Sunday in the Divisional Round. The current average price for the NFC Championship Game is $790.53, just $1 below the average price of last season’s NFC Championship Game against the San Francisco 49ers. The get-in price, however, is over $100 more expensive. Last season’s game had a get-in price of $330, while the least expensive ticket currently listed this year is $434. Despite the game being played on the West Coast, it will be the early game on Sunday, starting at noon Pacific time, but the early start has not halted demand around Seattle. (UPDATE - 1/5) With the Divisional Round now set, the Seattle Seahawks will set to welcome the Carolina Panthers to CenturyLink Field this Saturday. Seattle will get its first taste of postseason action after a first-place finish in the NFC West at 12-4. The Seahawks will look to make another spirited push to the Super Bowl, where they decimated the Denver Broncos at MetLife Stadium last season. Interestingly enough, ticket prices on the secondary market to Saturday’s game will be well below the Seahawks’ average at home this season. The average price for Seahawks vs Panthers tickets is now $381.04 on the secondary market, just below the season average of $397.12 for Seahawks tickets at CenturyLink Field in 2014. The game has dropped 32% from its $539.51 average after the Seahawks clinched a playoff berth, with a get-in price listed at $158. Pending a win in Seattle on Saturday, the Seahawks would move on the NFC Championship Round to play either the Dallas Cowboys or Green Bay Packers. A Super Bowl XLIX appearance would mark the Seahawks’ second consecutive and third franchise Super Bowl appearance, though they’ll have to get through Carolina and Dallas or Green Bay first. ... The Seattle Seahawks wavered slightly through the first seven weeks of the season, going just 3-3 in their first six games. The defending Super Bowl champions have turned it on since, winning their last five games en route to take on the St. Louis Rams at home in Week 17. Now at 11-4, the Seahawks can potentially claim the No. 1 seed in the NFC with a win over the Rams on Sunday, pending a Lions and Packers tie and Cowboys win. With the Divisional Round Game on the horizon, secondary ticket prices have skyrocketed at CenturyLink Field. Currently, the average price for Seahawks tickets to the team’s first playoff game is $539.51 on the secondary market, up 35.8% from their season average of $397.28 at home. 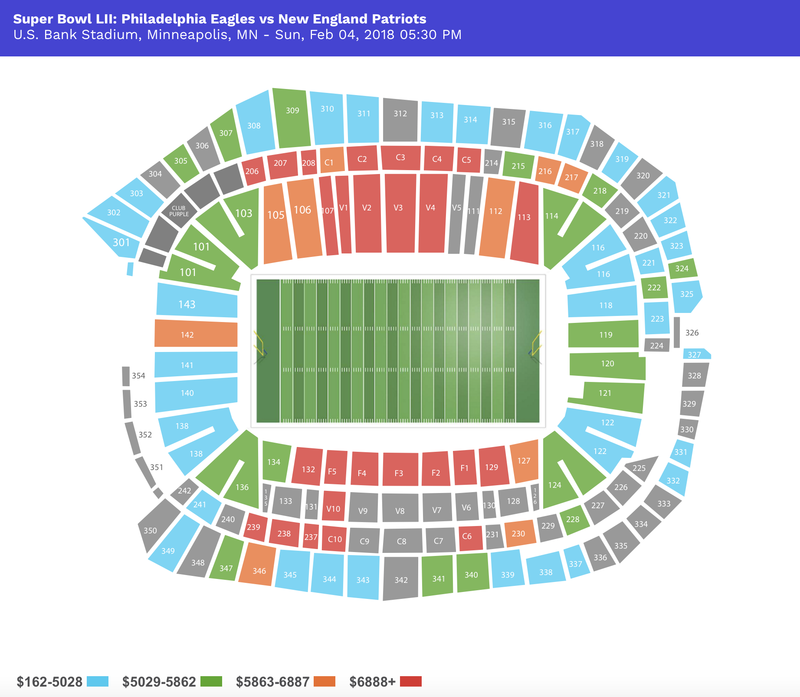 Get-in price for the game starts at $216, which is more expensive than what most NFL teams averaged at home on the secondary market this season. If the season were to conclude in Week 16, the Seahawks would claim a first-round bye and battle the lowest winning seed from the NFC Wild Card Round, which would either be the Cardinals or Cowboys. With the playoff picture still forming, however, the Seahawks see four other NFC teams own an identical 11-4 record on the season. The Lions and Packers will play a pivotal de facto NFC North Championship Game this weekend while the Cardinals and Cowboys also look to solidify a first-round bye. This means that Sunday’s game against the Rams is everything but a throwaway game; a win would further cement a top seed and possible Wild Card exclusion. No matter how the seeds play out, however, Seattle has clinched a postseason berth and will look to earn their second consecutive Super Bowl title in Arizona come February.